So baby is crying, crying, and...crying. Are you feeling helpless? That's okay. From swaddling to swinging to massaging, there are a variety of techniques you can use to calm your baby. But first, what is colic and why does it happen? 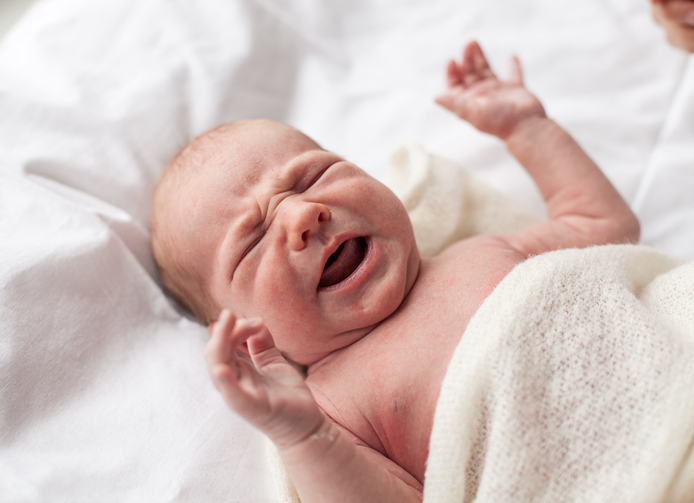 Colic is an attack of crying and what appears to be abdominal pain in early infancy and can affect babies in their first few months. It differentiates from normal crying in that it lasts for long periods of time, in which baby appears to be inconsolable. Episodes can last for hours at a time. The good news? It usually tapers off at three months. The bad news? You have to find a way to survive until then. But don't worry, we've got you. Read on for the some of the best ways to treat colic. Colic can be caused by over-stimulation so it's important to remove all aggravating stimuli from baby's environment. Wrapping baby in a blanket will give them the sense of warmth and security they need. Lay out the blanket on a flat surface and fold down the top corner of the blank. Place the baby onto the blanket. Move the baby's arm into position and then wrap the first side. Move the baby's other arm into position and close the bottom of the swaddle. Pull the right corner of the blanket over baby. Buy a swaddle blanket here. Whether it's some kind of sound machine, music from your iPod, or even just turning on your hair dryer, background noise can calm your baby. Babies respond well to simple motion. Place them in a swing like this. Babies are sometimes able to soothe themselves by sucking. Place a warm washcloth on baby's stomach. The warming sensation will calm them. Applying pressure can also help relieve abdominal pain. Check with your pediatrician about gas drops and probiotics. These can help with baby's abdominal pain. Gently massage baby's arms and legs. If you're breastfeeding, talk to your doctor about changing your diet. Certain foods can negatively affect the baby. In the crazy process of taking care of baby you are likely feeling stressed and overwhelmed. Remember to breathe and tell yourself this stage will pass. Remain confident. You are doing great! As parents, take turns caring for baby.